The interstellar space is filled with star dust which is postulated to be of biological origin. Fred Hoyle in his hypothesis of the life cloud has put forward an extraterrestrial origin for life on earth. The existence of an extraterrestrial force controlling the genesis and evolution of life on earth has been put forward by many authors. 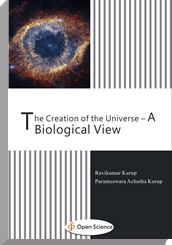 The biocosm theory postulates that the conditions in the universe have been so adjusted to make it possible for life to exist on earth and the universe. This leads to the postulate that the universe exists and reproduces because of life which acts as a quantal observer. This paper deals with the role of extremophilic archaea and RNA viroids extruded from the archaeal cells as primitive anthropomorphic observers making it possible for the universe to exists and evolve. The human race is divided into two species homo sapiens and homo neanderthalis. The homo neanderthalis interbred with homo sapiens to produce a hybrid species. Therefore there are species with more of neanderthalic origin and homo sapien species in earth. The previous studies have demonstrated matrilineal societies with more of neandethalic origin in contrast to patrilineal societies. The origin of neanderthalic societies and homo sapien communities was ascribed to symbiosis. The neanderthal species has more of extremophilic archaeal symbiosis occurring in the extremes of climate like the ice age and global warming. The homo sapien species has more of intragenomic RNA viroid/retroviral symbiosis which contribute to the dynamicity of the homo sapien genome. The Neanderthal species were retroviral resistant. The origin of the archaea and the RNA viroids are possibly from the interstellar space as archaeal clouds and RNA viroidal quantal computing clouds which function as extra terrestial intelligence. The RNA viroids are extruded by archaeal cells. They would have reached the earth via meteoroidal impacts and seeded life on earth. The archaeal colonies would have organized into the homo neanderthalic species in Eurasia and RNA viroidal colonies would have led to the evolution of homo sapien species in Africa.